MIXED MARRIAGES; CAN THEY EVER WORK? Ours is a tolerant era. Nevertheless, my friend’s family was startled and distressed recently to discover that their youngest sister, Mary, is considering marrying out of their faith. "Oh, Jimmy’s a fine man; hard-working, reliable, respected in the community. " say Mary’s brothers. "Plus he’s good to Mary. But….."
And, it’s a big ‘but’. For generations Mary’s family have been mixed farmers. They’ve suffered hail in Saskatchewan, floods in Manitoba. They’re resigned to poor crop prices, beef boycotts, unreasonable tariffs on their wheat, weather always against them. They’ve persevered because they were bolstered by two things- their trust in ‘next year’ and their uncompromising faith in John Deere. Mary’s grandfathers, father and brothers are John Deere men. Amidst the uncertainties of a farmer’s life there has to be one solid rock to which he can cling. For the Schuster family that rock is emblazoned with a running deer. But now, rumour’s circulating that, only two years after becoming a widow, Mary’s keeping company with a farmer devoted to, (can you believe it? ), International Harvester! 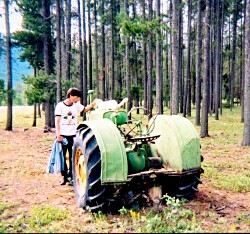 the now retired family tractor. Mark my words , there’ll be problems. After Xmas dinner, for example, when Uncle Hugh and Cousin Frank resume t heir annual debate about whether the John Deere 1790 Front-Fold Planter or the 1690CCS No Till Air Drill is better for soybeans, what’s Jimmy to do? Sit, picking at the turkey carcass with a sickly grin? He could, of course, defend the qualities of his favourite brand, but that is shaky ground. If his new relatives are contented and well-stuffed with Xmas cake, they may pretend to agree for the sake of family harmony. However, if Aunt Marguerite gave Jimmy the drumstick which always goes to Uncle Hugh, resentment might bubble over. Women quietly doing dishes would hear raised male voices declaring. "Well, I don’t know how anyone could cut a geranium with that type of harvester!" or "I’d rather plow with an ox that with that thing you’ve got!" Soon there’ll be all-out boasting. As the John Deere devotees recite their company’s accomplishments ; "Founded in 1837, grew from a one-man blacksmith shop to a world-wide corporation, one of the oldest industrial companies in the U.S, operates in 160 countries, employees 43,000 people world-wide." They will be met with a roar of rebuttal from Jimmy. "Is that so? Is that so? Who said size was everything? Remember the 1922 Farm All tractor? Nothing like the International Harvester Farm All! Inexpensive, light-weight, a row-crop, general purpose tractor. Every farmer’s friend, the Farm All!" Things worsen till the women are bustling about muttering "You tell Jimmy you’re sorry; you didn’t mean it," to men who have their shoulders hunched and their arms crossed defiantly. Suddenly Mary and Jimmy insist they have to leave early because it’s a long drive to their farm ten kilometers away. The family’s in turmoil for months. It doesn’t have to be like that. A tacit acknowledgement of different beliefs, an occasional complimentary remark, "See you got a new sprayer, nice colour!" will go a long way, as will reluctant, grudging acceptance of their brother-in-law’s pickup parked outside the Harvester implement dealer in the small town where they all shop, instead of forcing Mary and Jimmy to sneak off to Regina for a seed drill. Given half a chance Mary’s relatives may come to like Jimmy. It’s a matter to discuss with the children when they’re old enough to understand. "Yes, David, it’s true your Uncle Jimmy uses International Harvester machines. We have to respect his choice. He’s a good farmer; look at that crop of barley he got in last fall. We must understand that others sometimes chose a different swath, er, path, and though it may not be our way, we accept that, for them, it is the right one." Can mixed marriages work? Let’s ask the couple next Xmas.